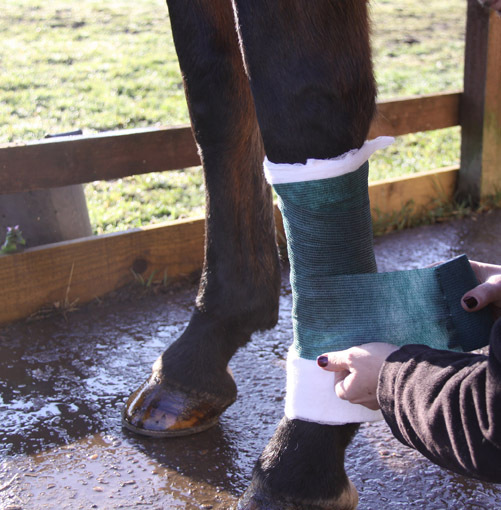 Robinson Animal Healthcare offers some practical advice on successful bandaging, including a few important guidelines to follow to improve your technique. Bandaging is used for several reasons and knowing how to do it well is important. When applied correctly, a bandage can assist in the healing process of an injury, but if applied incorrectly they can cause problems that will delay healing and potentially cause further complications. Bandaging is used for several reasons including first aid and injury, either to reduce swelling or secure dressings and for providing protection and support for tendons and ligaments during exercise and while travelling. Learning how to bandage is something that requires practice, and the secret of good bandaging lies in achieving correct and even tension. When applying a bandage to an injury or wound you should apply three main layers. The primary layer should consist of a low-adherent dressing which is placed directly on to the wound or on top of wound hydrogel which has direct contact with the wound surface. Robinson Animal Healthcare offer Vetalintex®, a sterile wound hydrogel that promotes moist healing conditions to regenerate healthy tissue. The dressing will prevent padded material sticking to the wound and should absorb any exudates produced from the wound. Dressings in direct contact with an open wound should always be sterile. The secondary layer is the padding that should be placed on top of the dressing to insulate, protect and control swelling. Veterinary Gamgee®, which is highly absorbent and has a uniform thickness, is ideal. The final layer is your bandage which should hold the other two layers in place. The application of this bandage is very important and a cohesive bandage such as Equiwrap® is ideal. Equiwrap® easily tears by hand so application is quick and easy and it sticks to itself but doesn’t stick to hair or skin. 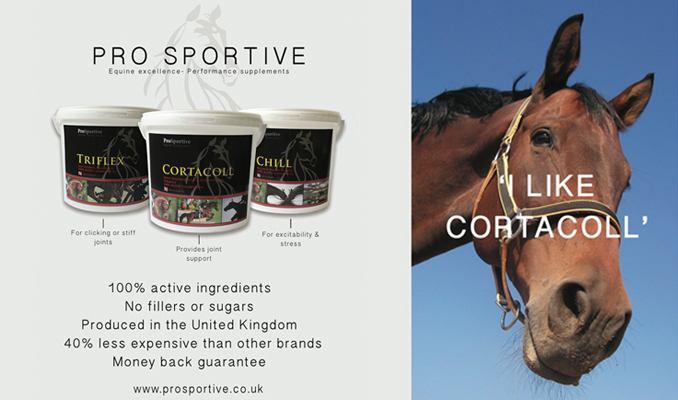 It is strong, lightweight and super soft which makes it an ideal choice. 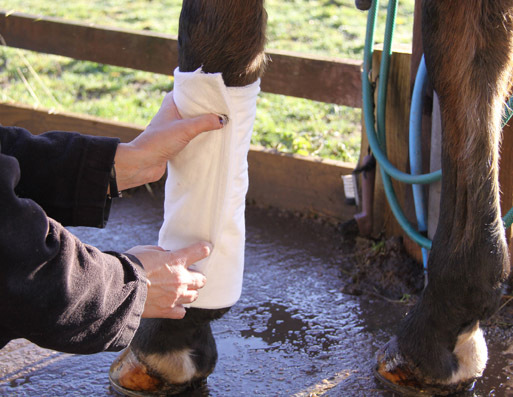 By following a few important guidelines you can improve your bandaging technique and ensure that whenever you need to apply a bandage your horse will receive the full benefit. Always apply a bandage with even pressure and a 50% overlap, taking care not to over-stretch the bandage. Bandage from the top and from left to right on the near side and right to left on the off side. 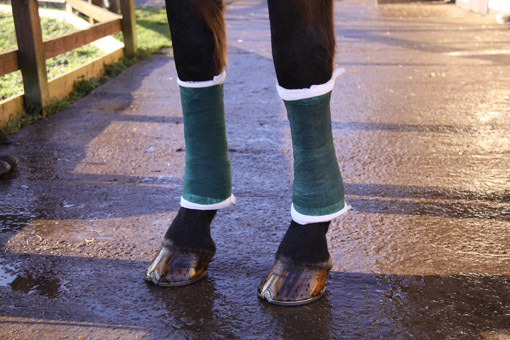 Never bandage the horse’s legs without padding, ideally using Veterinary Gamgee®. A bandage should never restrict circulation, unless used to apply pressure, as it can cause serious damage and affect the healing process. Make sure the bandage does not restrict movement especially when bandaging at the knee or hock, unless you are bandaging for immobilisation. For knee or hock wounds use a figure-of-eight bandage, crossing at the front of the knee or hock. Always bandage the opposite leg to provide support. Always keep a selection of bandages and relevant dressings in your first aid kit.